You are looking for the perfect match. First, I’ve begun an “agent wish list.” I opened up an Excel spreadsheet, and started pulling agent names from current and back issues of writing trade magazines. I’ve looked for interviews with agents on social media, because those agents are often looking for new authors. In my spreadsheet, I put the agent name, the name of their agency, contact information, and what they are looking for. These profiles almost always include a smiling photo of an agent. I can’t help but wonder if these agents are also googling me when they receive my submission. Are they scrolling through my blog, checking out some of my published work online, looking at my images on Google? Maybe. You try to find common interests. I have a confession to make. There’s an agent on my wish list I haven’t queried yet. It’s because she is so much like me that I KNOW my current project isn’t going to be the one that catches her attention. She wants something that is going to pull her away from a Law and Order: Special Victims Unit marathon and she’s fascinated by child psychopaths and serial killers. I’m pretty much her girl, but I haven’t written *that* book yet. When I do, she will be the first person I query! In the meantime, I have to admit I’m drawn to agents who prefer the same types of authors I do, the ones who are obsessed with true crime podcasts, and the ones I can really connect with in an introductory letter. Unfortunately, this time around, this whole searching for an agent process seems even more complicated. Every single agent or literary agency asks for something different, and because of this, each submission has to be completely personalized. So, forget just personalizing a query letter; you must read submission guidelines diligently. Query letter, one-page synopsis, first 2,000 words of the book? Check. Query letter, three-sentence synopsis, first 10 pages. Check. Submit through an online form that asks for all of the above as well as my social media accounts, well, okay. So far, I’ve queried five agents and gotten a polite rejection from one. In the meantime, I’m trying to stay busy by writing new short stories, entering a few contests, and getting back to revising a suspense/thriller young adult novel I wrote a few years ago during National Novel Writing Month. Wish me luck! What types of qualities would your dream agent possess? Renee Roberson is an award-winning writer and editor who also works as a marketing director for a nonprofit theatre company. 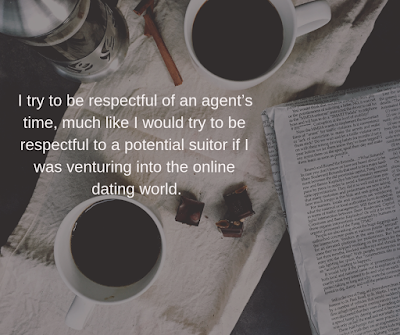 She’s not interested in online dating as she’s been married for 18 years, but she is looking for her perfect agent match! Visit her website at FinishedPages.com. Renee--That means 4 of the agents have NOT said no, which means you still have a chance of getting a yes from them. I DO wish you luck. My wish list for an agent: someone who LOVES rough historical fiction with some potential. An agent who adores working with first-time novelists. Someone who's willing to read the whole manuscript, who's willing to overlook the flaws (though they might be numerous) as they focus on the faint glimmer of talent. Great post, Renee! I love that you're doing your homework, and I'm definitely crossing my fingers and toes for you! You are doing everything right, and I'm sure the agents will appreciate the time and effort you spend researching them. My dream agent would be someone who would advocate for me and my work, keep my artistic vision in mind, help shape my work if needed, and someone with integrity who works hard to get the best deal. Oh oh oh. I need the kind of agent I described in the beginning, but once I snag them, I want the kind of agent Angela described. I hope finding an agent isn’t too much like online dating!! Ugh!! Neither one is for sissies. They have to love nonfiction but also be able to rep fiction. And picture books, unillustrated. A generalist?